The Iowa Utilities Board (IUB) recently accepted a proposed rule change from Alliant Energy, one of Iowa’s two major electric utility providers. 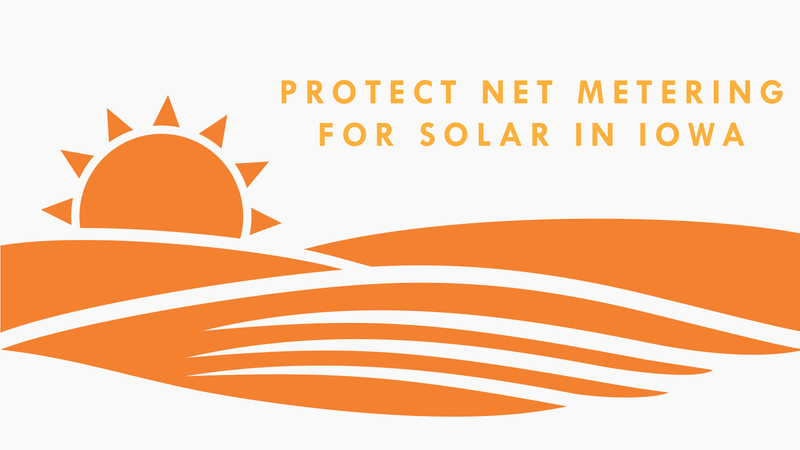 This new ruling will drastically change how net metering works in Alliant’s service territory and will reduce the financial viability of new solar installations for both residential and smaller commercial customers. Alliant Energy’s new tariff takes effect on April 1st of this year and will impact Alliant’s 488,000 electrical customers across Iowa. To file an opinion online, simply copy, paste and edit (if you wish) the text in the letter below into the message body of the online form. Alliant Energy’s new net metering tariff add a cap on how much solar generation is eligible for net metering. Under current rules, net metering is naturally capped by a customer’s total annual energy usage – how many kilowatt (kWh) of electricity are used in a year. Under the new, more complex tariff, net metering will be capped based on an arbitrary estimate of a customer’s annual peak demand the year prior to the solar installation. Industry calculations show that the new ruling could reduce available net metering by 62% for residential customers and by 68% for small business customers. Solar installations larger than the cap won’t make financial sense. This is an extraordinarily complex and opaque system – among the most complicated in the nation. We believe this ruling could end residential solar in Iowa, dramatically curtail small business solar, and severely damage the solar industry. Under the current rules a typical Iowa household using about 12,000 kWh of electricity per year could purchase a 10 kW solar installation that would save the family $1560 in the first year and pay for itself completely within 10-11 years. The design lifecycle of solar is 25 years. Under the new tariff, only 3.43 kW of the same 10 kW installation would be eligible for net-metering, and would save the same family only $979 per year and take 18-19 years to pay for itself. The design lifecycle of solar is 25 years. On February 23, the Environmental Law and Policy Center, Iowa Environmental Council, Iowa Solar Energy Trade Association, Solar Energy Industry Association, Sierra Club, Vote Solar and Winneshiek Energy District made a filing asking the IUB to reconsider Alliant’s changes. The Iowa Utilities Board has 30 days to respond. The Iowa Utilities Board needs to hear from the public too, so if you’re concerned, please weigh in on the matter. The Iowa solar industry employs more than 600 people, and supports jobs throughout the supply chain and manufacturing industries in Iowa. Iowa is home to more than 40 solar energy companies, and at least nine facilities involved in the manufacturing of solar parts. In the past four years alone, $123,248,595 has been invested in solar using the Iowa solar investment tax credit. By the end of 2016, 97 of Iowa’s 99 counties have seen solar investment utilizing the solar investment tax credit. The proposed Alliant change would harm this important industry that is growing Iowa’s economy. Demand charges are typically used for commercial utility customers. Demand charges are based on maximum electrical demand over time. If electricity were water, demand charges would be based on the size of the pipe, not on how much water flows through it. High demand charges, particularly those calculated over periods of months or years, significantly undermine the economics of commercial solar systems. What is the Iowa Utilities Board? The Iowa Utilities Board (IUB) is a public commission that regulates power, water, and telecommunications in Iowa. The three members of the board are appointed to six year terms by the Governor. What is the Alliant Energy? Alliant Energy is the public utility holding company of Interstate Power and Light, one of the utilities in the state of Iowa. Most Iowans get their electricity from Interstate Power and Light, MidAmerican, or one of the rural electric cooperatives. Most solar installations in the state until now have been among Alliant Energy customers. What is the Iowa Energy Plan? The Iowa Energy Plan was an initiative set forth by Lieutenant Governor Kim Reynolds in 2016 to lay the ground work necessary to reaffirm Iowa’s energy leadership into the future, collaborating locally, growing sustainably, and leading nationally.